The Wits food garden is getting a make-over with the help of engineering and art students. 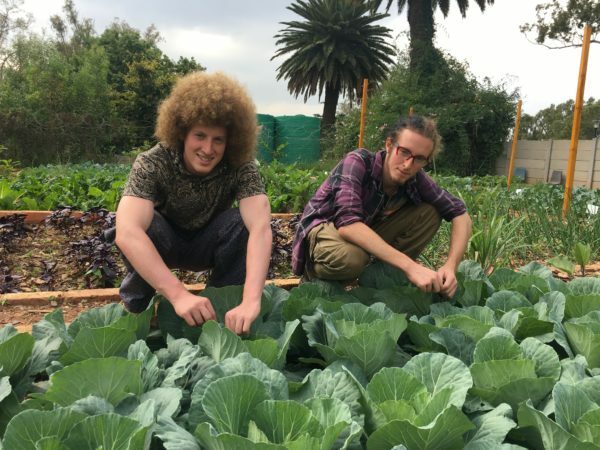 The Wits Citizenship and Community Outreach’s Food Bank (WCCOFB) are revamping their student-run garden together with Wits Engineers Without Boarders (EWB-Wits), the Wits Inala Forum and Organised Chaos Dimension 23 (OCD23). Wits Vuvuzela spoke to garden managers and second year BSc students, Keelan Krinsky and Jezri Krinsky. “The current renovations are designed to improve the efficiency of the garden, really aiming at maximizing the productivity of the available land. The renovations, which have already been completed, have increased our output dramatically,” said Keelan. Renovations of the garden include levelling and sectioning the garden, by means of a brick grid, as well as amending the soil to increase its health and productivity. Wooden poles have been installed as part of a plan to enclose the entire area in shade cloth for UV and frost protection. An irrigation system, which is managed by EWB-Wits member, is also underway. The Wits Inala Forum is a volunteer-based student society focused food sovereignty and climate justice. “EWB chose to get involved with Inala because we believe we have a similar vision and mission. So, a collaboration with them will be beneficial to [EWB-Wits] members and the community at large,” said Eunice Bohulu, chairperson of EWB-Wits and chemical engineering student. “The produce from the garden is distributed through the WCCOFB to students in need,” said Keelan. The walls in the garden are in the process of being painted by OCD23 art students and volunteers. The plan is for the garden to be completed by June 2018. Wits Vuvuzela, WCCO to launch a student food kitchen this year., February 9, 2018.